I love a Sunday pamper routine. Don’t we all? It includes a gritty exfoliator, the Vichy Pore Purifying Clay Mask I spoke about here, a fruit enzyme brightening mask, and a pore clarifying charcoal strip that does absolutely nothing I’ve come to realise! After all of this, plus an overlong shower, a scalp detox and super hydrating conditioner, and a thorough blow dry and straightening session, it’s no wander I’m too lazy to bother with my nails. But hey, being a girl is fun, right? My aim in doing all of this, is to walk into work on Monday feeling myself. But like clockwork, I always have the worst night’s sleep on Sundays! Knowing that, most of my Sunday pamper efforts are to help me look less like a zombie when I walk through that door. Kind of like an insurance policy! Monday night is when I put things right. I use the Philip Kingsley Elasticiser for a heavy dose of hydration my hair will need after washing and straightening it two days in a row. When I feel overtired or under the weather, I prefer bath and body products with rich and warm scents. Right now, Laura Mercier’s Crème Brulée Honey Bath and Souffle Body Crème fit the bill. In danger of going overboard with those radiance products, I don’t have any problem using both REN’s Glycolactic Radiance Renewal Mask and Vichy’s Idealia Peeling, despite the levels of glycolic and lactic acids. Just like that, I’m a different person on Tuesdays! Do you have any favourites to hide the signs of sleepless nights? 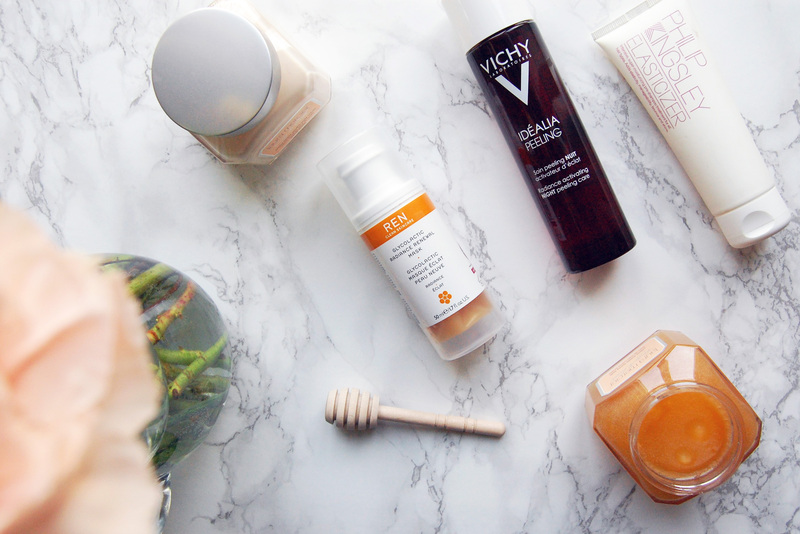 I really want to try out vichy skincare. I've heard really great things about them. Especially that Vichy idealia peeling. I'm all for radiant looking skin. I like what I've tried of Vichy so far, but be mindful of the ingredients. A lot of their products aren't as wonderful as presented, and have mineral oil. You know, I still haven't found a product that can lift the darkness. But like you say, wearing glasses has made me less conscious about them, and I keep the area as hydrated as possible. Plus a concealer to cover and then highlight. I also started feeling less conscious when I found out they are hereditary in most cases. I feel you! Sometimes I catch myself on Glycolic product number two wondering if I'm about to burn myself with excess!